Retirement planning is not confined to saving money only. It refers to the systematic approach that can build retirement corpus, which is sufficient to meet post-retirement financial obligations. Most individuals may involve in various saving schemes or insurance scheme or mutual funds to build a handsome retirement corpus, with the lump sum or regular income. However, most people find this process pretty daunting. Choosing the best saving scheme without prior knowledge can be difficult. If you are facing the same issues, then you have come to the right place. Because I am going to compare two most important retirement schemes in this guide. The Indian Government does not hesitate in taking serious steps for saving schemes in the country. The authorities are completely focused on the financial empowerment of Indian residents. That’s why the government has introduced several schemes for the section of society. So, everyone can build the retirement corpus regardless of the income scale. In my previous articles, I have talked about two most popular saving schemes, i.e. National Pension Scheme and Atal Pension Yojana. In this guide, we are going to compare both schemes. Cut to the chase; I cannot choose one scheme over another. Because both schemes have been created for the specific reason. It is your job to choose the right for your current financial position, and I will assist you in making that decision! People should take investment in pension seriously. Because right pensions scheme will lead you to good retired life. In this regard, the government came up with Atal Pension Yojana and National Pension Scheme. Both pension schemes are targeted to particular section and age group of people. But share the common objective of catering people with financial security. Before we move to the comparison, we must have a brief about both schemes. Every Indian resident can avail National Pension Scheme, above the age of 18 years. Unlike other schemes, its returns are not fixed. Because this scheme is market linked, your investment will be distributed in different equity and fixed income investment classes. It is all about you and your choice. Here, you have to option to choose the distribution of investment in different classes. This scheme offer lump sum withdraw once you attain the age of 60 years, but you have to purchase an annuity with 40% of total amount. You can consider Atal Pension Yojana as the most daring act of the current Indian Government. Before this scheme, the idea of retirement corpus was limited to salaried persons only. The government took this fact into consideration and came up with Atal Pension Yojana. It is targeted at the low-income class of the society. Any individual between 18-40 years eligible for this scheme. After the retirement age, the subscriber will get fixed income of Rs. 5000. Honestly, this could not get any better! Anyone resident between an age of 18 – 60 years can join National Pension Scheme. Only Indian resident can avail service of APY. In a case of NPS, Indian residents & NRI can join the scheme. APY offers five pension slab with the range of Rs.1000 to Rs. 5000. Pension Fund Manager decides the pension slab in NPS. Whereas, the subscriber has to invest 40% of a corpus for purchasing annuity or pension. In APY, you will get the guaranteed pension as per chosen pension slab. 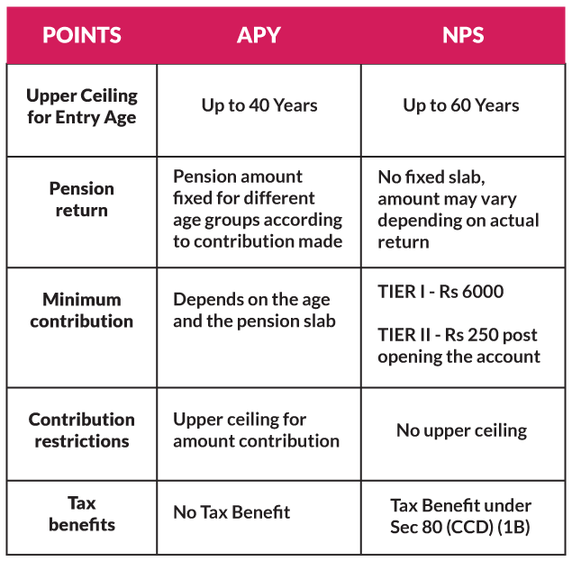 In NPS, the pension amount is not guaranteed. Because the investment is made in different classes. Secondly, the annuity amount is determined at the time of withdrawal. In APY, there is only one type of account for one individual. In NPS, the subscriber can open Tier I and Tier II account as per the choice. In APY, the government promised to make the contribution of Rs. 1000 for five years, if the account was opened before 31st December 2015. Whereas in NPS, the government does not make any contribution. In APY, you will get no tax benefits. NPS is an attractive scheme with tax rebate up to Rs. 2,00,000. People join APY to get the guaranteed pension after the age of 60 years. Secondly, it is introduced for the low-income group of people. NPS is utilized by employees to build a handsome retirement corpus. In APY, you will get no advice or service from Fund Manager. In NPS, you have the option to select the Fund manager, who will manager your investment in different classes. APY account can be opened at any authorized Indian bank or post office. While NPS account can be opened at POPs. In APY, the minimum contribution amount varies as per the age and chosen pension slab. In NPS, the minimum contribution for corporate & all citizen model is Rs. 6000, 10% of salary & DA for government employees and Rs. 1000 – Rs. 1200 under NPS-Lite. Both schemes hold their purpose and objectives. We cannot give importance to one over other. The final verdict is that Atal Pension Yojana is an ideal investment for low-income class, who wish to have guaranteed pension after retirement. While National Pension Scheme is perfect for corporate and government employees, who can mold the investment options as per needs and choice!